The 67th Cannes Film Festival begins in just over a week, and cinephiles are gearing up for the discoveries ahead. One of them that has shot to the top of the radar is the follow-up film from Turkish filmmaker Nuri Bilge Ceylan, who left an impression at Cannes in 2011 with Once Upon a Time in Anatolia, winning the Grand Jury Prize. His newest is titled Winter Sleep and it's been shrouded in mystery and secrecry every since filming last year. Our friends at The Film Stage have found the first trailer and now we get to see how stunning and riveting this looks. There's a reason this film is IONCinema's #1 most anticipated of 2014 and that's because it looks magnificent. While it doesn't have English subtitles, the footage is still worth seeing. 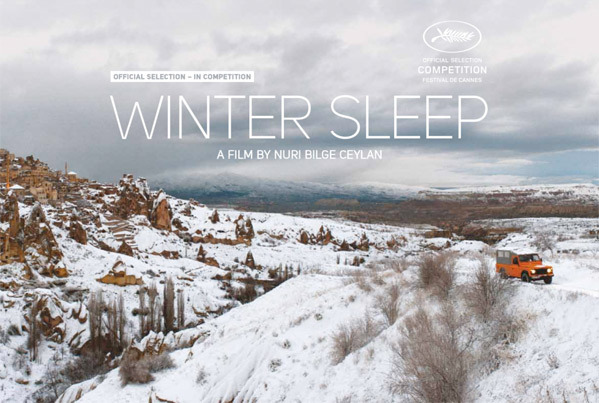 Winter Sleep, or Kis Uykusu, is directed by Turkish filmmaker Nuri Bilge Ceylan, of the films Once Upon a Time in Anatolia, Üç Maymun, Climates, Distant, Clouds of May and Kasaba previously. There are not many plot details available as of yet, and all Ceylan is prepared to say (via Sony.co.uk) is: "Winter Sleep is about humans – it’s a drama set in the middle of Turkey, in Anatolia. We captured many kinds of images on location, shooting in Cappadocia over wintertime. There are many kinds of landscapes, human-scapes and portraits, sometimes in snow, sometimes in cloudy weather and more seldomly sunny images as well." The film is premiering at the 2014 Cannes Film Festival as an In Competition film. It runs 3 hours, 16 minutes. Stay tuned for updates on Nuri Bilge Ceylan's Winter Sleep after it premieres at the Cannes Film Festival. That awkward moment when you can't read French subtitles but you can understand Turkish in an English website. The film looks good, sadly they are not advertised at all, here in Turkey; I'm not even sure if it will - or the previous ones had - hit the theaters. I guess we don't have the right audience here. I guess I must be blind, but this look sort of boring to me. Some folks talking. A crying woman. A man firing a rifle. So what?